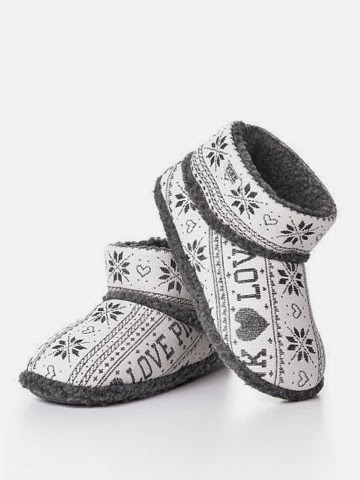 I desperately wanted those cute booties for winter because I want to be more productive at home. It's hard to get out of bed and believe me I got my house coat on and a t shirt (normally I don't wear pants, I have the oversized t shirt thing going) AND I'm wearing pants!!! But my little piggies just freezing over here! Metropolis had a few pairs of size L (I need a medium) so I went over to VS anyways to put my hunt to rest. Behold! the large size does not fit me, as I try to convince myself they do. The sales sees me and gladly checks the other bins for a medium. She assured me they're scattered through out the store, and to give her a chance to look around. Disheartened, I sat and waited ... Already knowing what the answer was, since I phoned yesterday. I went to pay and notice their signature puppy dolls behind the cash counter. I asked jokingly "oh are those display only??" Cashier tells me "they're gift with purchase." Over joyed I asked my love "which color matches the rainbow one I have at home ?"